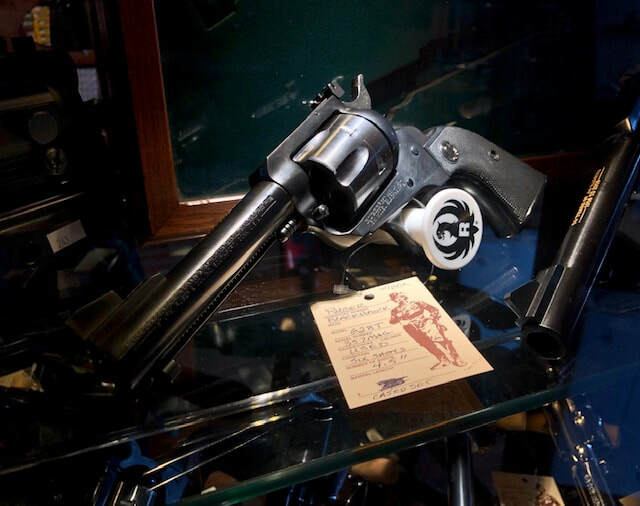 Willey Brothers Purveyors of Fine Firearms, located in the Historic Huffaker Ranch House in Reno, NV, offers a relaxed setting for buying, selling and trading guns! Come experience a no-pressure environment where the firearms are out and accessible, allowing our guests to get a feel for what they're shopping for. Browse at your leisure, then holler out! We're here to help you! We offer a wide variety of ammunition and accessories, as well as, good ol' hospitality! Please stop in, whether you're a first-time gun owner or a seasoned collector--we look forward to chatting with you! We specialize in unique finds! We welcome your used guns and trades! We pride ourselves on great prices and that ALSO includes best dollar given for your used guns and trade values! We offer free appraisals, single items or entire collections. We'll give you honest figures and invite you to shop around. We aim to earn your business! Gentlemen & ladies alike will appreciate hand crafted, custom fitted holsters, belts and rigs made locally by Mernickle Holsters, from concealed carry holsters to rich cowboy action shooting set ups. Custom orders welcome! We have L.A.G.! After much demand we've brought in L.A.G, a local kydex holster manufacturer that is consistently at the top of the pack in performance, customer service & ingenuity. I've seen their holsters in shops as far east as South Carolina, but they're right here at home in Reno, Nevada! Customer service is top notch, lifetime warranty & the custom order shop is right down the road. All of L.A.G's custom Kydex holsters come standard with BOTH IWB and OWB (inside and outside the waistband) belt loops. This allows you to go from concealed to open carry in minutes with one holster. We also offer a full line of the highest quality names in concealed carry needs!